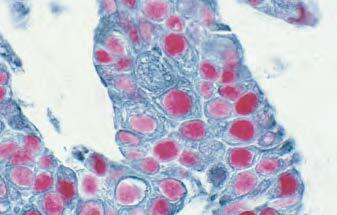 For example, to detect a primary antibody made in rabbit, the appropriate choice is a VECTASTAIN® ABC Kit designated Rabbit IgG. 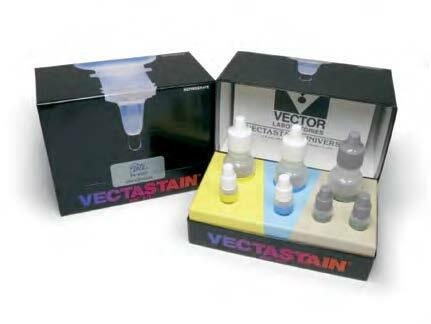 VECTASTAIN® ABC Kits are available in economical concentrated formats. For additional convenience and ease of use some peroxidase-based kits are offered in ready-to-use prediluted stabilized formats. Tumor: • Ki67 (m), VECTASTAIN® Elite® ABC Kit, Vector® DAB (brown) • CD34 (m), VECTASTAIN® ABC-AP Kit, Vector® Blue (blue) • Cytokeratin AE1/AE3 (m), VECTASTAIN® ABC-AP Kit, Vector® Red (red). 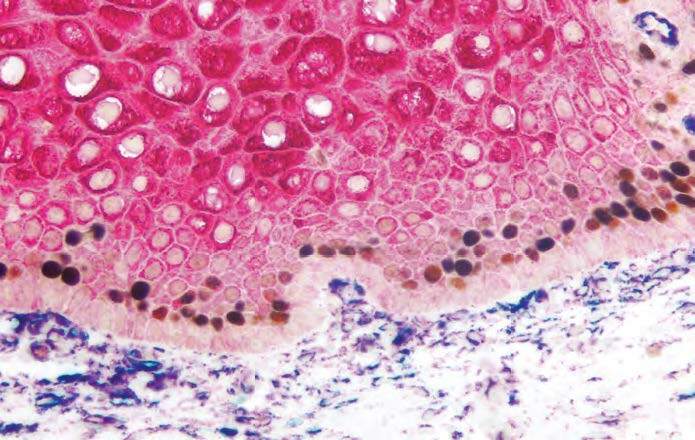 When choosing the optimal detection system for your application, it is important to consider not only the species of the primary antibody but also the species of the tissue under examination. If the species of the primary antibody and the species of the tissue are closely related (for example, rat and mouse), the biotinylated secondary antibody may cross-react with endogenous IgG in the tissue section. 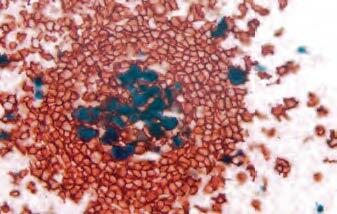 This can lead to background staining. Directly label the primary antibody with biotin (ProtOn™ Biotin Labeling Kit, PLK-1202) and detect it using the VECTASTAIN® Elite ® ABC Kit (Standard – PK-6100, includes VECTASTAIN® Elite ® ABC Reagent only) followed by an HRP substrate. Alternatively, label the primary with HRP (ProtOn™ HRP Labeling Kit, PLK-1203) and develop with an HRP substrate. Use a biotinylated secondary antibody specifically adsorbed to remove cross-reacting antibodies of closely-related species (e.g. 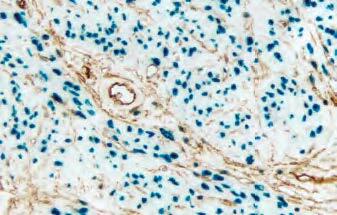 biotinylated anti-mouse IgG, rat adsorbed). Use the Mouse on Mouse (M.O.M.™) Immunodetection System for applications of mouse primary antibodies on mouse tissue (p. 24-25). After choosing the VECTASTAIN® ABC Kit for your application, select a substrate that matches the enzyme system of the kit (p. 26-29). Endometrium: • Progesterone Receptor (rm), VECTASTAIN® Universal ABC- AP Kit, Vector® Blue AP Substrate (blue) • CD34 (m), VECTASTAIN® Universal Elite® ABC Kit, Vector® DAB HRP Substrate (brown). Tumor: • p53 protein (m), VECTASTAIN® ABC-AP Kit, Vector® Red AP Substrate (red) • Pan-Cytokeratin (sheep), VECTASTAIN® Elite® ABC Kit, Vector® SG HRP Substrate (blue/gray). 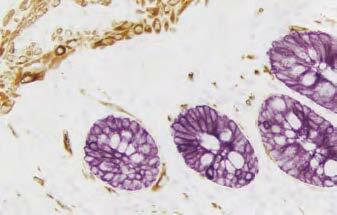 Intestine: • Desmin (m), VECTASTAIN® Elite® ABC Kit, ImmPACT™ DAB (brown) substrate. 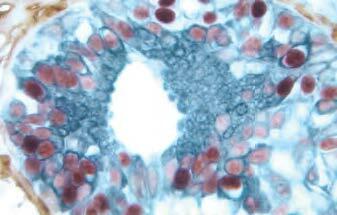 • Cytokeratin (m), VECTASTAIN® Elite® ABC Kit, Vector® VIP (purple) substrate. Tonsil: • Cyclin A (m), VECTASTAIN® Universal ABC-AP Kit, Vector® Blue AP Substrate (blue) • CD20 (m), VECTASTAIN® Universal Elite® ABC Kit, Vector® NovaRED™ HRP Substrate (red). Breast Carcinoma: • Estrogen Receptor (m); VECTASTAIN® Elite® ABC Kit, Vector® NovaRED substrate (red) • CD34 (m), VECTASTAIN® Elite® ABC Kit, DAB substrate (brown) • Cytokeratin 8/18 (m), VECTASTAIN® Elite® ABC Kit, Vector® SG substrate (blue/gray). 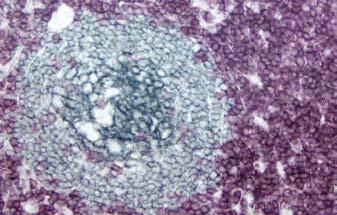 Tonsil: • CD3 (m), VECTASTAIN® Universal Elite® ABC Kit, Vector® VIP substrate (purple) • CD20 (m), VECTASTAIN® Universal Elite® ABC Kit, Vector® SG substrate (blue/gray).